Seriously...What more can you ask for? We know you're busy ~ 100's of emails a day and 1000's of articles and info. Membership in the Radical Joy Seeking Women's Club is more than just access to information online. It's becoming a part of a community. A community of women, eager to meet and connect with other like-minded women, make friends, swap stories, share experiences. PLUS, you'll have access to 3 top trained, certified, expert coaches, to ask & get your questions answered. In addition, we interview other experts and authors from around the world and share their expertise with you as well! Wouldn't it be nice to get what you need in one place anytime you'd like? Once you are a member, you can have just that. Searchable access to lessons, exercises, coaching, books, interviews and anything else we think you might like! We follow our hearts and keep creating and searching for valuable content that you will love! Try us out for 7 days, you may cancel at any time during your first week if it's not everything you hope for. After your first week, once you've fallen just as madly in love with us, as we are with you, your membership will continue and you will be billed just $49 per month. Most coaches charge $100 per hour or more. Take advantage of your membership to ask the coaches questions and participate in our members only private group. Sign up now for your 7-day free trial, you won't be sorry! We'll see you in the Club! Our mission: Empowering Women World Wide to take their Personal Growth to Heart! ~ Access to Expert Calls held via teleconference on Zoom. 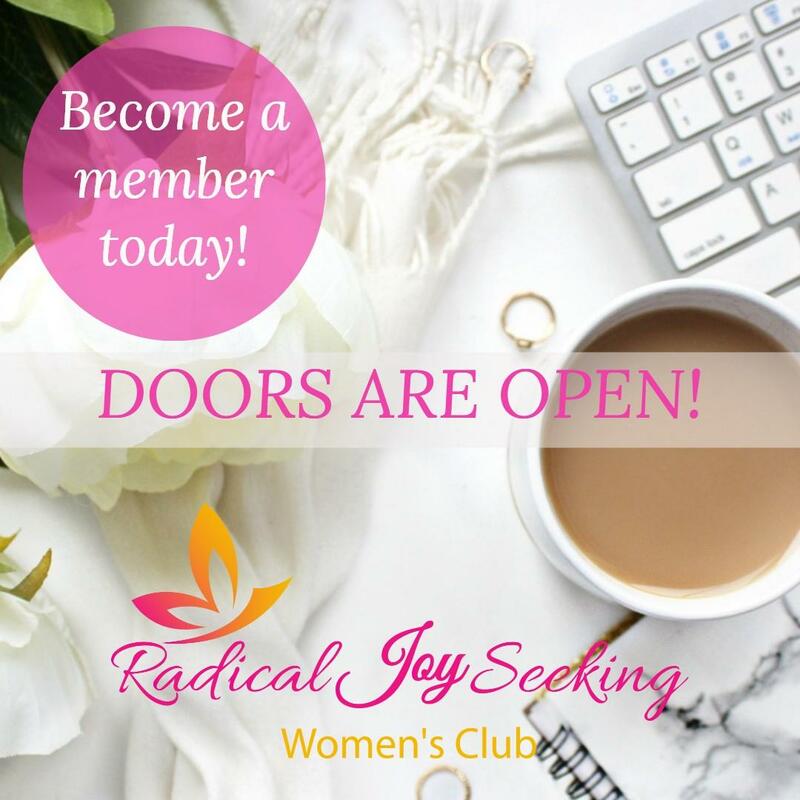 You will be able to see the experts and attend live training, watch interviews, participate in live coaching calls and meet and connect with other Radical Joy Seeking women (members)! ~ Early Registration (like first dibs) for all of our Women's Retreats and Live Events! This is HUGE as space is limited and they sell out fast! ~ Discount on Personal Coaching with our Experts if you chose to hire them for some 1:1 coaching. ~ $100 off all of our Retreats and Live Events! ~ Access to our Private Facebook Group, this one is EXCLUSIVELY for members and a place where you can meet and connect with the other members to discuss content, training and anything else club related. All for Just $49 per month! Your journey to joy starts here! We are so excited that you've decided to join us inside the club! Get ready to meet your tribe, connect, learn and grow as we all up-level together! Welcome ~ we are so glad you are here. This is a great way to set it up and forget it...the payment, not the club! Have access 24/7 365 days a year and don't worry about a payment again for a full year! Instant savings of $223 over monthly payment plan! Our newest and most popular option for membership is Lifetime Access for one price. Pay once, never worry about monthly or annual payments again.